The Ace Attorney games or Gyakuten Saiban are a series of highly acclaimed court-room games developed by Capcom wherein you place as the titular lawyer “ Phoenix Wright “ solving a myriad of cases full of colourful characters and intriguing mysteries. The story was adapted into a live-action movie in 2012 and a brand new anime series is airing this Spring season (2016 ). The anime is produced by A-1 Pictures the studio responsible for numerous hit anime such as , Fairy Tail ( seasons 1 and 2 ) and Blue Exorcist. The 2d backgrounds are detailed and look good all throughout but I noticed quite a few awkward 3d shots that didn’t blend in well and looked static the most notable is at the very beginning of the first episode when the court room opens , this is a stock scene in every AA trial, the animation jumps from 2d to 3d and then to a blend of 2d and 3d before going back to 2d. I don’t understand the choice of making the public in the court-room 3d models since it’d have been easier (and would have looked better ) to keep them 2d. Another design quirk that I didn’t understand was when the show was formatted to look like the game, e.g. in the testimony where a great orange border flashes above saying, “ TESTIMONY “ , it felt redundant to try to maintain the look of a game when adapting it into another medium and for example the choice to allow the attorney to walk around freely instead of being chained to their stands as in the games was a nice shift from mediums and something the show could do with more of. The non-interactive medium takes away from the Ace Attorney experience since half of the fun of the game is that moment where something clicks in your head and you can go “ AHA , OBJECTION ! “ and feel like the best attorney ever. The opening animation reflects the series two toned nature nicely as it blends the upbeat with the melancholy as is the nature of Phoenix Wright games. The transitions between shots are well done and there is lot of clever imagery using well known icons and a striking gold colour the closing song manages to do this quite well as well. Anyone who’s played a Phoenix Wright game knows that for all the drama and murder the series doesn’t that itself too seriously. It was nice to see the humour from the games translated to the anime since it allowed for faster punch lines and visual gags. The voice actors seemed well suited to each character sounding like I imagined them to. The addition of sound-effects from the games was a nice touch as was the choice to keep the iconic tracks from the games in since there’s nothing more satisfying than finding a contradiction and having the theme kick in as you tear the prosecution to pieces. Now to get into the negatives: the designs of the characters seemed off like their bodies were much broader than their heads , the facial designs felt odd and unnatural with a lot of inconsistencies , there was minimal detail put into the faces so everyone looked rubbery, these could be a put-off for fans of the games who are used to more detailed design. The animations for the characters are disappointing as well everything feels and looks stiff. The walk cycles look about as fluid as moving a Lego-man. The lip flaps are embarrassingly lazy being nothing more than circles opening and closing sometimes not even synced properly to the audio. These issues do get better but are a major distraction when you jump in at the beginning. The first episode felt very lacklustre and lazily put together which it shouldn’t have done seeing how big the name ,” Phoenix Wright “ is in both Japan and the US but I will admit that it steadily improved while the show progressed albeit it never looks perfect. 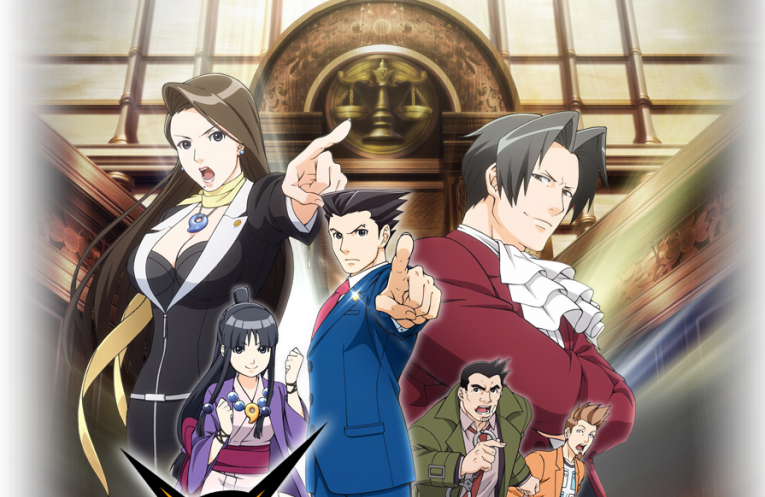 But while it’s sub-par as an anime I still found myself enjoying seeing that the characters I love on the screen so while long standing fans should check it out I’d recommend people trying to get into the Ace Attorney universe pick up the game themselves. With a universe as rich and full of stories to tell, Ace Attorney could successfully continue on for multiple seasons but only if the visual and audio issues are addressed a problem that the anime shouldn’t even be having if the studio bothered to spend a bit more on making the show look good. Trying to write an original case as opposed to rehashing the games’ stories could provide an interesting narrative to a possible second season. But I guess we’ll have to wait and see if the studio has any real passion for this project or is just using the name for a quick buck.